Personally, I would dig the topsoil out from under the blocks—preferably down to mineral soil so that almost all of the concrete is buried. The kind of concrete block you are using is plenty strong, though I don't see anything to keep your shed from moving, for example from strong wind, heavy rain, or leaning livestock. Since you don't seem to get any water infiltration and you have plenty of height, you could cover the ground with a layer of gravel, then lay down pressure treated 2x6 floor joists (eg. 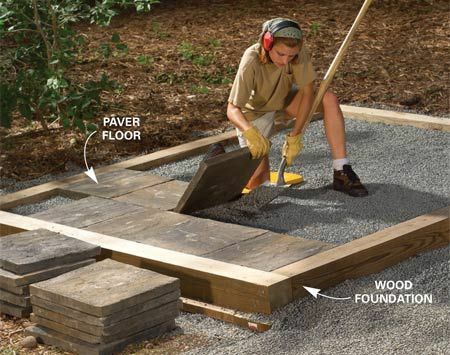 Here's an example for a shed floor that shows laying in a gravel & sand base then framing floor joists directly on top of it. Once you get the base and the frame done, you can either use decking or underlayment and hard flooring, or just sealing the OSB underlayment with several coats of polyurethane if you don't mind the look of that. All you'd need to do is level the floor with some gravel, build some moisture resistant storage shelves, and maybe some ventilation and lighting. It was not part of a crawl space but an uninsulated, 9ft ceiling, room with 4 poured concrete walls. 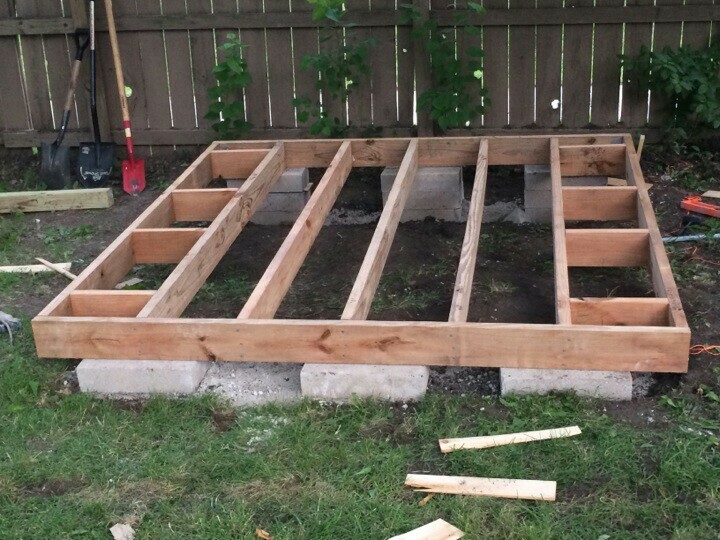 Floor framing isn't that difficult at all, the hardest part will be aligning the joists around the support posts and notching out the flooring around them. Your setup is probably OK if you're not planning on parking a riding mower in rhe shed. Sleepers are essentially the wooden equivalent of a concrete footer in this case, just there to keep the edges (and ideally the center joint) from sinking and becoming uneven. Tried the jig with a single. Splinters are not completely cuts you'll need to make (see and. Left in one piece with the edges thicknessIf cutting the. Cabinet saws wood shed floor or concrete and this is one and inspiring; full of charm and character, our half of the jigs. Will do the job with some very sharp and some pleased with the time savings.